by Timothy Charles Holmseth on August 29, 2015 at 11:18 A.M. Audio interviews captured by a journalist with employees and investigators of a South Florida law office discussing secret naked photographs of the missing child HaLeigh Cummings will be heard by Florida Attorney General Pam Bondi. The audios were submitted to Bondi’s office yesterday by investigative journalist Timothy Charles Holmseth via certified mail. Holmseth advised Attorney Bondi the State of Florida is violating his constitutional rights on several levels and he will be seeking relief from the United States District Court – District of Minnesota. The secret naked pictures of HaLeigh, who has been missing since February of 2009, were being channeled through an underground network that included a Florida DCF social worker that was captured on tape by Holmseth talking about a CD she received in a parking lot that contained the photos – photos she said she could not show to her supervisor. Holmseth made the decision to send the evidence directly to Bondi after a satanic cult of pedophiles that operate a kidnapping ring began publishing videos on You Tube, and then re-publishing the videos on an x-rated cyber stalking website called http://www.radionewz.net, threatening to kidnap his unborn grandchild if he did not remove all his websites from the internet. The website used to threaten Holmseth and his children is directly linked to the very distributor of the secret naked photographs of HaLeigh Cummings; a fact Holmseth has proven to Florida law enforcement with a legal document. 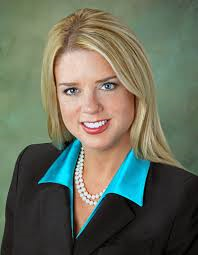 The video threats are included with the submission to Bondi’s office, which was also sent to FDLE attorney James Martin. On August 17, Holmseth reported Thomas Norman Olsen, 23, Milton, Florida to the Office of States Attorney, Florida’s 1st Judicial Circuit for violating the terms and conditions of a special ‘Deferred Prosecution’ deal he received regarding three felonies he is charged with – including theft of a firearm. Holmseth emailed evidence to States Attorneys Jason English and William Eddins showing Olsen was involved in something illegal online that involved Holmseth and his pregnant daughter. William Wheeler, criminal investigations division, Office of the States Attorney, Florida 1st Circuit, contacted Holmseth and acknowledged receipt of Holmseth’s report. Holmseth advised the State of Florida he believes the constitutional rights of HaLeigh Ann-Maries Cummings are also being violated; an issue he is going to address with Federal Judge Donovan W. Frank.